This is not a religious blog, and that’s not about to change. But religion and spirituality are a big part of life, even for those not conventionally religious, and it is certainly an area where communication skills matter on a lot of levels. What I have in mind here, though, has bearing on any communicator, religious or not. As I write this, it is Saturday before Easter. 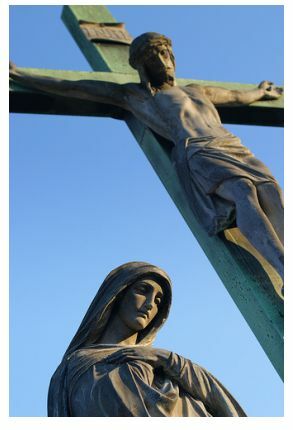 Because of the events commemorated around this time of the year, a lot of attention falls on Good Friday, and of course tremendous attention on Easter Sunday. (Yes, I know about all the interrelationship of Easter bunnies and pagan celebrations. It’s beside the point for this post.) Some groups have traditions around Holy Saturday as well, the day Jesus “rested” in the tomb, and also the time of the Harrowing of Hades. It is also sometimes called Black Saturday, a day of mourning. For some reason, it has really struck me this year because of those first mourners. Obviously, Jesus suffered the most, but those who loved Him on earth suffered also. Friday was the worst; Sunday, everything changed. But Saturday? Saturday was the Sabbath, supposed to be a day of rest. How restful could it have been for the apostles? For His friends? For His mother? The story of Mary really came together for me this year. Last Christmas, I really thought a lot about what it must have been like for such a young girl (as we think Mary was, probably 14 to 16 years old, though some sources suggest as young as 12) to go through what she did leading up to the birth of Jesus. By the time the ministry of Jesus comes along, Joseph is no longer in the picture. The canonical gospels never tell us his age, but the apocryphal Protoevangelium of James paints Joseph as an old man at the time of his charitable marriage to Mary, chosen by lot, with children from an earlier marriage (possibly explaining the brothers and sister of Jesus). In any case, it appears Mary is a widow, now watching her son (and perhaps her only son) dying in a way most horrible, witnessing it with her own eyes, and unable to do anything about it. Before the Sabbath began, He was put in the tomb. What must the evening have been like for her? What must the “day of rest” have meant to her? When you face those times that St. John of the Cross called the dark night of the soul (and we all have them), is waiting it out often the hardest part? It is for me. I have trouble even watching movies sometimes; I want the problem to get fixed immediately. But that’s not how good stories work, and that’s not how life works. Sometimes, it takes awhile to go through Hell. It’s apparently a big place. Here is the insight you can use in your own communication: the power of story. Christianity, as well as other major religions, didn’t become major because of philosophical brilliance or theological perspicacity. It was the power of the story–the extended, overarching story , and the hundreds of embedded stories. I will admit I wrestle with theological questions, attempting to understand thing that, by their nature, cannot be fully understood. But those are not the things that draw me spiritually. Jim Cathcart and Mark Sanborn have both made the point that people don’t make decisions based on logic. They make decisions based on emotion; they justify decisions based on logic. I think what I believe is reasonable, based on evidence, but that’s not what really moves me. What moves me is vicarious experiences like that of Mary, watching the son an angel told her would occupy the throne of David and be called the Son of the Most High die nailed to a tree, and then trying to get through Saturday. Your blog touches on it a little but people, particularly nonbelievers, are like Thomas: give us empirical evidence of the existence of God, let’s find Noah’s ark or the Holy Grail or the Ark of the Covenant and we’ll believe. But they won’t because once you prove something, it is no longer “belief”. Religion, or spirituality if you will, is based on faith not facts. That dark Saturday must have felt like faith had left the world to those closest to Jesus. So much so that on Sunday and thereafter they didn’t recognize Jesus when they saw him.